Logic Masters India conducted Sudoku and Puzzle Championship at Cognizance 2010 in IIT, Roorkee on 27-28th March 2010. I created some of the puzzles for this championship. Ritesh and his brother Hitesh represented Logic Masters India at the fest. 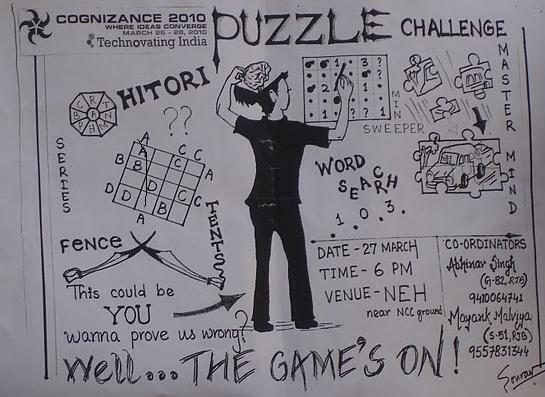 According to Ritesh "The puzzle Championship was a huge hit. The no. of participants for both the championships were much more than the initially no. expected participants. :-) Number of participants had to be restricted to around 250 each in the preliminary round due to space constraints & control issues. The enthusiasm in participants was very high. The finals were held in an open area with all the participants solving on A1 size sheets on Big Boards. This attracted loads of people and there was a huge crowd watching the finale taking place. Many individuals came seeing the competition taking place with such a crowd and showed there interest in participating in the same, but were sent back since it was the third and final round of the Championship." It is a really nice to see Logic Masters India (LMI) moving, popularizing and growing.